Creativity, innovation, disruption; you know the buzz words. I and many others have written extensively on the topic; from the creative destruction of health and wellness to the latest innovations in fitness and health. Why ? I hear it from many well respected and highly touted professionals almost daily, "The Fitness and Health Club Industry have got to change." The purpose for writing on these subjects is to reassure my colleagues that yes things are going to change and its going to be sooner than later. Thanks to my colleague Eleanor Hisey at Fitsomo who shared a post that I just had to use from Gary Vaynerchuk, and to my partner Robert Dyer who spent so much time with me last week. These two along with my conversation with some of Gold's Gyms leading franchisees at the GGFA roundtable on social media last week led to this post. By the way it meant a great deal to me to be invited by Ginger Collins and the great bunch of GGFA professionals, who I love, to discuss social media marketing at the Gold's convention. Thanks Ladies :). I was particularly excited that Gordon Johnson, along with several other leading Gold's franchisees, were there and asked so many relevant questions. They wanted to know about using social media, yet the conversation was less about technology and more about being human. I'll explain. Four years ago I began writing about how the physical and digital worlds are merging . Little did I know I'd be wearing a pair of Google Glass so soon. 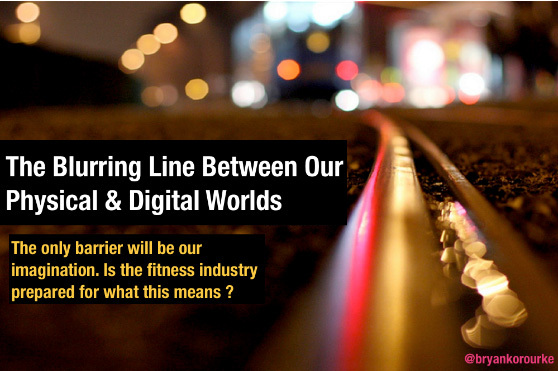 This has profound implications for the delivery of fitness, wellness and health in general. Consistent with the law of accelerating returns, technology that is enabling this blur continues to roll out at an exponential pace and its becoming quite fascinating. The implications and possibilities are only going to be limited by our imaginations.